Pedros Inn is the most inexpensive accommodation in San Pedro, Ambergris Caye and probably in all of Belize! 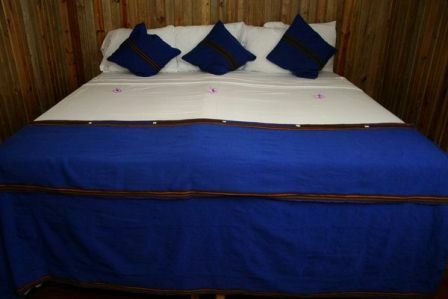 Providing a cheap vacation option for the budget-minded traveler, our Inn has been designed for people who prefer to spend their money on important things like partying, scuba diving, sunbathing, kayaking, windsurfing, sailing, swimming, snorkeling, drinking and generally having a great time rather than paying a fortune to sleep. Traveling to San Pedro, Belize does not need to be expensive, sometimes the discount travel option is the perfect alternative for a cheap vacation.Pedros Inn is a fun place at great value with clean, comfortable rooms. Each day in San Pedro is a 'Living the Dream' Day'. Our Hostel rooms are the perfect discount deal for Backpackers traveling through Mexico, Belize, Guatemala and the rest of Central America.Chose from one of fourteen (14) Hostel Rooms with 2 single beds per room - rates starting as low as $10 (US) per person, per night. 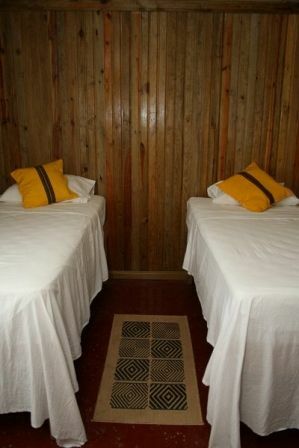 These rooms are perfect for Backpackers stopping in San Pedro while traveling through-out Central America.Other Vacation Package Options:Full Bar and Pizza each night; Cheap travel deals on snorkeling, diving and mainland Belize adventure tours; Travel planing to other areas of Belize as well as other Caribbean locales, Mexico, Guatemala, Honduras and beyond.Pedros Inn Amenities:Swimming Pool; Free use of Kayaks; Free WiFi; 24-Hour Security; Sports Pub with large flat-screen TV, Projection TV with Nintendo Wii games available, Pool table and Foosball table on premises; 2 minute walk to the best beach in San Pedro, Ambergris Caye.CONDITIONS:A deposit of $100 USD per suite or room is required at time of booking and final payment prior to the the guests arrival*. Full payment due date requirement is based on the following season schedule:Jan 4th through Easter Sunday: 45 daysDay after Easter through Dec 20th: 30 daysDec 21st through Jan 3rd: 90 daysThere are no refunds for cancellations that occur after the final payment due date or less (based on seasonal schedule above). Initial $100 USD booking fee is non-refundable. There are no refunds for late arrivals or early departures. *If the total of your bill is less than $100 USD, the total price of your bill will be charged at the time of booking. 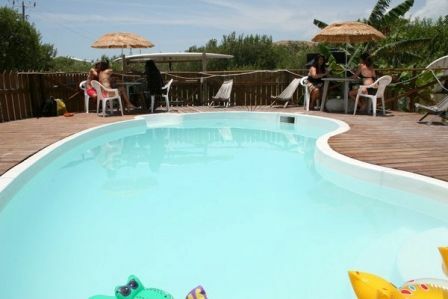 We are a 5 min walk from either water ferry dock, and a 5 min walk from San Pedro airstrip. We are 2 buildings north of the Living Word Church (on Princess Drive).Located just south of downtown San Pedro. From the air strip, follow Coconut Drive south past Island Academy (about a 5 minute walk) and just follow the signs from there.From the Watertaxi terminal, travel south out of downtown San Pedro past the airstrip past Island Academy and just follow the signs from there.